Home / Review / “Indian Telecom Services Performance Indicator Report” for the Quarter ending December, 2014. “Indian Telecom Services Performance Indicator Report” for the Quarter ending December, 2014. TRAI today released the “Indian Telecom Services Performance Indicator Report” for the Quarter ending December, 2014. 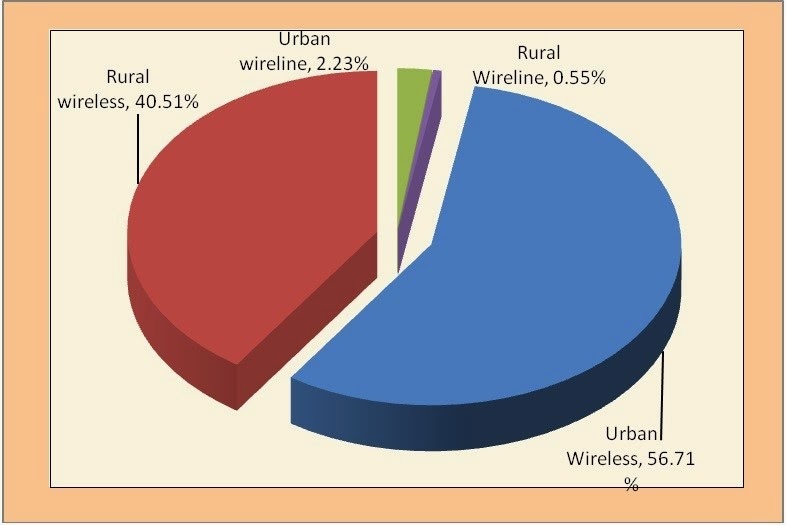 This Report provides a broad perspective of the Telecom Services and presents the key parameters and growth trends for the Telecom Services as well as Cable TV, DTH & Radio Broadcasting services in India for the period covering 1st October to 31st December, 2014 and is compiled on the basis of information furnished by the Service Providers. Executive Summary of the Report is enclosed. The complete Report is available on TRAI’s websitewww.trai.gov.in. 1. The number of telephone subscribers in India increased from 957.61 million at the end of Sep-14 to 970.97 million at the end of Dec-14, registering a growth of 1.40% over the previous quarter. This reflects year-on-year (Y-O-Y) growth of 6.09% over the same quarter of last year. The overall Tele-density in India increased from 76.75 as on 30th Sep-14 to 77.58 as on 31st Dec-14. 2. 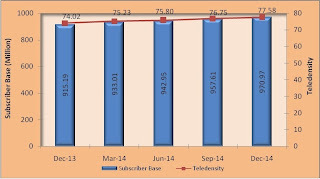 Subscription in Urban Areas increased from 569.56 million at the end of Sep-14 to 572.29 million at the end of Dec-14, however Urban Tele-density slightly declined from 148.07 to 148.06. 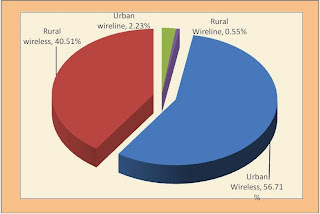 Rural subscription increased from 388.05 million to 398.68 million, and Rural Tele-density also increased from 44.96 to 46.09. 3. Out of total subscription, the share of the Rural areas increased from 40.52% at the end of Sep-14 to 41.06% at the end of Dec-14. 4. With a net addition of 13.77 million subscribers during the quarter, total wireless(GSM+CDMA) subscriber base increased from 930.20 million at the end of Sep-14 to 943.97 million at the end of Dec-14, registering a growth rate of 1.48% over the previous quarter. The year-on-year (Y-O-Y) growth rate of wireless subscribers for Dec-14 is 6.51%. 5. Wireless Tele-density increased from 74.55 at the end of Sep-14 to 75.43 at the end of Dec-14. 6. Wireline subscriber base further declined from 27.41 million at the end of Sep-14 to 27.00 million at the end of Dec-14, registering a decline of 1.48%. The year-on-year (Y-O-Y) decline rate of wireline subscribers for Dec-14 is 6.56%. 7. Wireline Tele-density declined from 2.20 at the end of Sep-14 to 2.16 at the end of Dec-14. 8. Total number of Internet subscribers has increased from 254.40 million at the end of Sep-14 to 267.39 million at the end of Dec-14, there has been a quarterly growth rate of 5.11%. Out of which Wired Internet subscribers are 18.86 million and Wireless Internet subscribers are 248.53 million. 9. Number of Broadband Internet subscribers increased from 75.73 million at the end of Sep-14 to 85.74 million at the end of Dec-14 with quarter growth rate of 13.21%. 10. The number of Narrowband Internet subscribers has increased from 178.67 million at the end of Sep-14 to 181.65 million at the end of Dec-14 with quarterly growth rate of 1.67%. 11. Monthly Average Revenue Per User (ARPU) for GSM service increased by 2.35%, from `116 in QE Sep-14 to `118 in QE Dec-14, whereas Y-O-Y increased by 5.80%. 12. Prepaid ARPU for GSM service per month increased from `101 in QE Sep-14 to `103 in QE Dec-14, and Postpaid ARPU per month increased from `459 in QE Sep-14 to `466 in QE Dec-14. 13. On an all India average, the overall MOU per subscriber per month for GSM service is 376 for QE Dec-14 remained almost at the same level as in the previous quarter. 14. Prepaid MOU per subscriber for GSM service increased from 351 in QE Sep-14 to 352 in QE Dec-14, whereas postpaid MOUs decreased from 954 in QE Sep-14 to 933 in QE Dec-14. 15. Monthly ARPU for CDMA full mobility service decreased by 1.49%, from `110 in QE Sep-14 to `109 in QE Dec-14. ARPU for CDMA has increased by 4.8% on Y-O-Y basis in this quarter. 16. 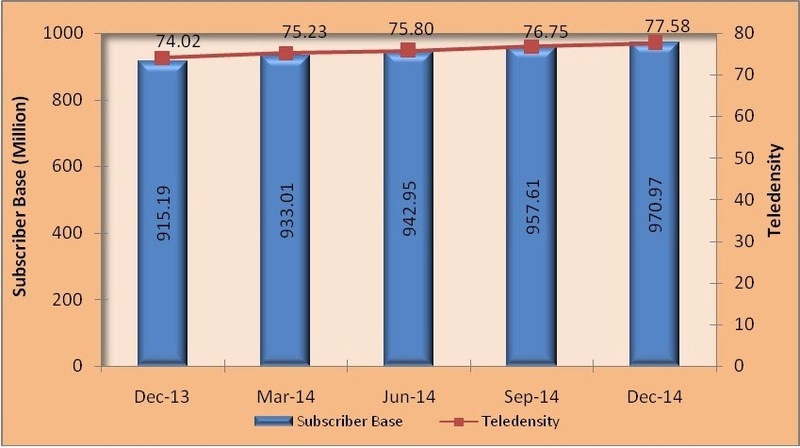 The total MOU for CDMA per subscriber per month decreased by 1.91%, from 267 in QE Sep-14 to 262 QE Dec-14. The outgoing MOUs decreased from 141 in QE Sep-14 to 139 in QE Dec-14 and incoming MOUs also decreased from 126 in QE Sep-14 to 123 in QE Dec-14. 17. 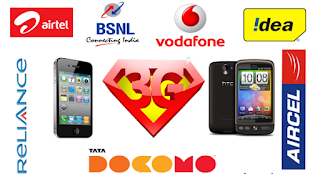 Gross Revenue (GR) and Adjusted Gross Revenue (AGR) of Telecom Service Sector for the QE Dec-14 has been `63955 Crore and `43591 Crore respectively. GR and AGR increased by 2.41% and 0.84% respectively in this quarter as compared to previous quarter. 18. The year-on-year (Y-O-Y) growth in GR and AGR over the same quarter in last year has been 9.54% and 10.15% respectively. 19. Pass-through charges accounted 31.84% of the GR for the quarter ending Dec-14. The quarterly and the year-on-year (Y-O-Y) growth rates of pass-through charges for QE Dec-14 are 5.97% and 8.26% respectively. 20. The License Fee increased from 3459 Crore for the QE Sep-14 to 3489 Crore for the QE Dec-14. The quarterly and the year-on-year (Y-O-Y) growth rates of license fee are 0.86% and 10.14% respectively in this quarter. 21. 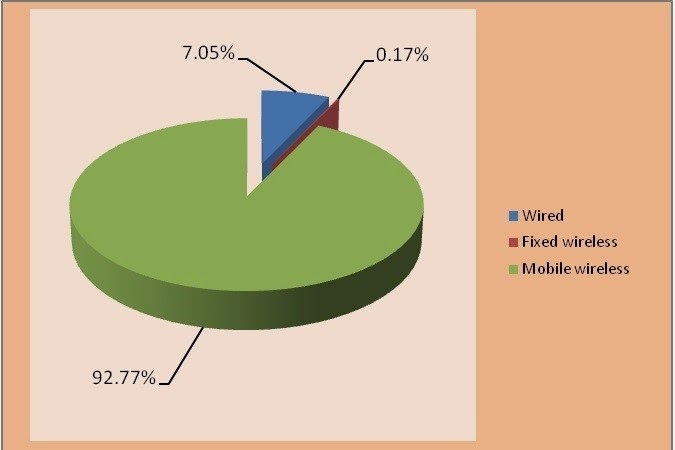 Access services contributed 79.24% of the total Adjusted Gross Revenue of telecom services. In Access services, Gross Revenue (GR), Adjusted Gross Revenue(AGR), License Fee, Spectrum Usage Charges(SUC) and Pass Through Charges increased by 2.41%, 0.84%, 0.86%, 4.31% and 5.97% respectively in QE Dec-14. 22. Monthly Average Revenue per User (ARPU) for Access Services based on AGR increased from `118.20 in QE Sep-14 to `119.48 in QE Dec-14. · Time taken for refund of deposits after closures. 26. 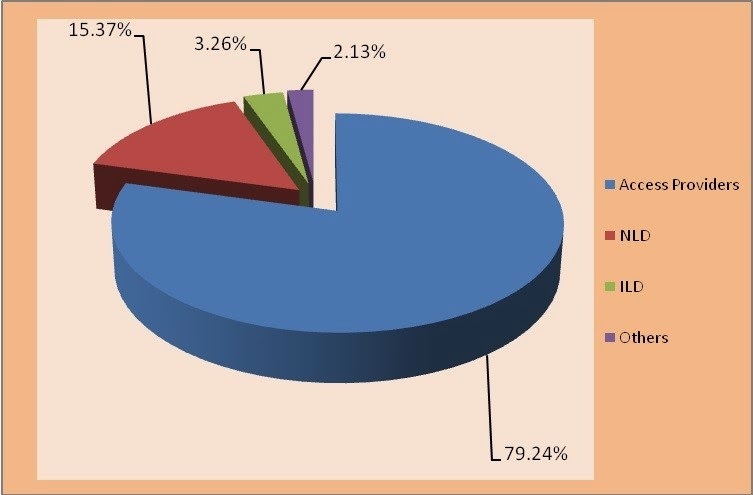 A total of 826 private satellite TV channels have been permitted by the Ministry of Information and Broadcasting (MIB) as on 31st December 2014. There are a total of 245 Pay channels as reported by broadcasters as on 31.01.2015 and these details have been uploaded on TRAI’s website along with the names of the respective broadcasters. 27. In Non-CAS areas, the maximum number of TV channels being carried in a digital form by any of the reporting MSOs is 398, while in conventional analogue form, the maximum number of channels being carried by any of the reporting MSOs is 100. 28. 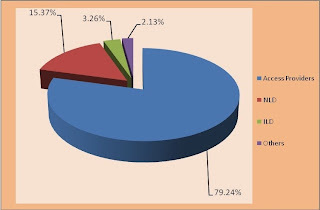 Apart from All India Radio, Prasar Bharati – a public broadcaster, there are 243 operational private FM Radio stations as on 31st December, 2014. The information therein is as received from MIB. 29. At present, apart from free DTH service of Doordarshan of Prasar Bharati – a public broadcaster, there are 6 private DTH Operators. All these private DTH Operators are offering pay DTH services. As per the information submitted by the DTH operator through quarterly PMR for DTH services, total number of registered subscribers and active subscribers being served by these six private DTH operators, as reported to TRAI, are 73.06 million & 40.54, million respectively as on 31st December 2014. Considering the rapid growth of e-commerce business in the country in the recent past, the Department of Posts, through Delhi Postal Circle has taken up a project to establish the e-commerce Centre at Safdarjang, New Delhi-110003.This processing centre will handle exclusively all the e-commerce business with the state of the art technology driven facility for quick and smooth operation starting from booking till dispatch from the centre. The Centre is equipped with modern technology and newly introduced conveyor belt where parcels get sorted with the help of conveyor belt. As a result, the e-Commerce Centre is now capable of handling 30000 parcels/articles per day. The parcels are collected from the e-commerce customers, processed & dispatched within 24 hours to respective destination through quickest available flight/train, as the case may be. The leading e-commerce customers, viz., Amazon, Paytm, Yepme, Snapdeal, etc are already availing the benefits of fast, reliable and safe processing of their e-commerce parcels at the newly established e-commerce Centre at Safdarjang in New Delhi. India Post Mobile App is also launched by the Hon’ble Minister of Communications & Information Technology on the occasion. .This is an android based application developed by Centre for Excellence in Postal Technology (CEPT), Mysore. The application includes features like real time tracking of accountable articles, Post Office search, Postage calculator, etc through Mobile Phone. The Government has decided to reduce the levy on rice upto maximum 25% in Kharif Marketing Season (KMS), which has started on 1st October 2014. With reduction in levy, the Government Agencies through cooperative societies/self help groups etc., are undertaking procurement of paddy directly from the farmers thereby ensuring direct payment of Minimum Support Price (MSP) to the farmers. This is to reduce irregularities which exist in levy procurement system and to evolve better outreach of the procurement machinery to the farmgate. Under direct procurement of paddy, the State Government & their agencies adopt various measures to safeguard interest of the farmers in marketing of their produce, such as proper grading & weighment of paddy, timely payment of MSP through cheque / online banking system, transportation of paddy from procurement centers to the storage points etc. In view of these benefits, the Government has further decided to stop procurement through levy system w.e.f. 1st October 2015. • States have been advised to allow free movement of fruits and vegetableas by delisting them from the APMC Act. • State Governments are being requested from time to time to take action well in advance for filling up of vacancies of President and Member and to maintain a panel of candidates for filling up of future vacancies also to avoid delay in appointments. • Circuit Benches from National Commission have been frequently visiting the States. • Some State Commissions have constituted Additional Benches mainly to dispose of backlog of pending cases. • The National Commission and some of the State Commissions as well as District Fora are adopting the process of holding Lok Adalats for speedy disposal of the cases. • Financial assistance is provided by the Central Government to the States/UTs for strengthening of infrastructure of Consumer Fora including computerization and networking. • Consumer Protection Act, 1986 is being comprehensively amended to provide, inter alia, for speedy disposal of cases. · to defer implementation of NFSA in States that have not done end to end computerization; have not put the list of beneficiaries online for anyone to verify, and have not set up vigilance committees to check pilferage form Public Distribution System (PDS). · to reduce coverage from 67 percent of population to 40 percent; raise allocation to priority households form 5 kg to 7 kg per person per month. · to gradually introduce cash transfers in Targeted Public Distribution System (TPDS), starting with large cities with more than 1 million population; extending it to grain surplus States, and then giving option to deficit States to opt for cash or physical grain distribution. · The States/ UTs are already required to comply with certain pre-requisites like completion of the ongoing scheme for computerization of Targeted Public Distribution System operations, which includes putting up digitized list of beneficiaries on transparency portal; putting in place grievance redressal mechanism, etc. as per requirement of NFSA, in order to start implementation of the Act. · The NFSA is already in force. There is no proposal for any amendment to the Act. · Direct transfer of cash subsidy is one of the options discussed in various fora for checking diversion of foodgrains. Its implementation, however, depends upon readiness of States/ UTs in terms of digitization and de-duplication of beneficiary data-base seeds with bank account numbers and it can be taken up on specific requests from States/ UTs. Before implementation of the National Food Security Act, 2013 (NFSA), States/Union Territories (UTs) are required to complete various preparatory activities and have to certify their preparedness. Allocation of foodgrains under the Act has started to 11 States/UTs based on the preparedness and identification of beneficiaries reported by them. Remaining 25 States/UTs have not completed all the preparatory measures required for implementation of the Act. Names of these States/UTs are – Andhra Pradesh, Arunachal Pradesh, Assam, Goa, Gujarat, Jammu & Kashmir, Jharkhand, Kerala, Manipur, Meghalaya, Mizoram, Nagaland, Odisha, Sikkim, Tamil Nadu, Telangana, Tripura, Uttar Pradesh, Uttarakhand, West Bengal, Andaman & Nicobar Islands, Dadra & Nagar Haveli, Daman & Diu, Lakshadweep and Puducherry.